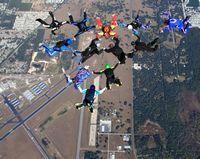 Several Relative Work Skydivers have linked together to form a large formation. These larger than normal post cards are high quality and measure 216x139mm. Please Note: All post cards will be shipped by Recorded Delivery. Shipping charges are subject to change. The price quoted includes shipping within the United Kingdom, foreign customers please check our shipping information at the bottom of the home page. Please email me to place your order quoting the Product Code Number.